It happens every January, like clockwork. A rash of media coverage marveling about the birth of twins. While twin births are always incredible, they’re not exactly newsworthy, given that there are over 130,000 twin births every year, or about three percent of all births. 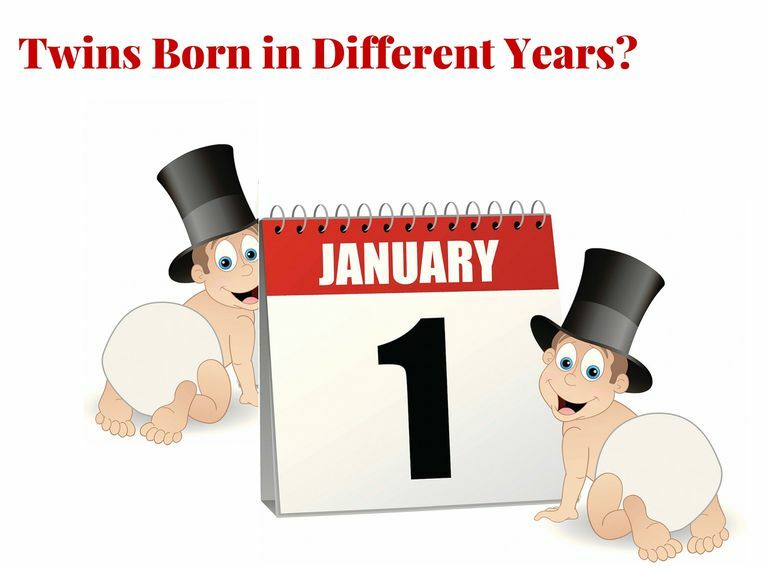 What makes these births remarkable every January is that these twins manage to arrive at a point in time which gives them not only different birthdays but different birth years. For example, in 2015/2016, a set of boy/girl twins were born in San Diego. A baby girl named Jaclyn was born at 11:59 p.m. on December 31, 2015, while her brother Luis arrived at 12:02 a.m. on January 1, 2016. In 2013/2014 in Washington, D.C., another set of boy/girl twins straddled the new year. Yaleni Begazo arrived at 11:58 p.m. on Tuesday, December 31, 2013, while her brother, Brandon Ferdinando Begazo made an appearance at 12:01 a.m. on Wednesday, January 1, 2014. (Ladies first, in both cases!) An interval of three minutes between births isn’t uncommon for twins, especially if they are delivered via c-section, but because they straddle the midnight hour, they gain notoriety. In Ontario, Canada, twin sisters Gabriela and Sophia Salgueiro managed a similar feat. Gabriela led at 11:52 p.m. on December 31st, followed by her sister, who barely beat the New Year deadline, arriving only 38 seconds past midnight on January 1, 2014. Their birth was a bit of a surprise since the girls’ due date wasn’t until January 19th. Their mom achieved a bit of notoriety at Mississauga Credit Valley Hospital by delivering both the last baby born in 2013 and the first baby born in 2014. Abilene, Texas greeted yet another set of twins straddling the midnight hour. Hannah Grace and Danielle Lynn Reed were delivered by c-section on either side of the New Year. Their mom promises that they’ll each have their own birthday parties. Of course, this phenomenon isn’t unique to 2013 or 2016. It happens every year. And while remarkable and special, some other twins can make an even greater claim to fame .... being born in different millennia. The Wallman twins from Indianapolis, Indiana were born at 11:59 p.m. Friday, December 31, 1999, and 12:01 a.m. on Saturday, January 1, 2000. Additional millennial-straddling twins were reported in Oklahoma, Virginia, Washington, and Germany. That’s something we won’t see again for another one thousand years. What Does the Term Irish Twins Actually Mean? Do Twin Girls Fare Better in the Womb Than Twin Boys?